Two of Dave Brubeck’s sons have been doing their thing, his kind of thing, for more than 16 years in the Brubeck Brothers Quartet. Clearly, they’ve got it all together. Their most recent CD Lifetimes was one of the 2013 Top Ten Jazz Radio Airplays. The Quartet jumps into town for just one gig at the Holland Center’s 1200 Club to continue such musical evocations of their paternal inspiration. 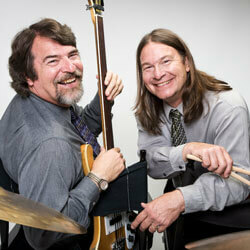 Brothers Dan on drums and Chris on bass meld with long-time partners guitarist Mike DeMicco and pianist Chuck Lamb. DeMicco had been an enduring member of electric jazz quartet, The Dolphins. And he’d played with Dave himself, as well as with Jack DeJohnette, Mose Allison and others. He also performed on Garrison Keillor’s Prairie Home Companion, plus Jazz in America on PBS. As for Lamb, he’s been at keyboards with Bela Fleck, the Woody Herman Orchestra, Eddie Daniels, Richie Cole, Larry Coryell and more. “The Brubeck Brothers have no fear of an odd tune signature or meter, and basically end up having their own way of perceiving time. With a respectful nod to the past and an adventurous eye toward the future,” said the Albany Times Union. Nuff said.